I've been wanting to go to Bora Bora for a long time. 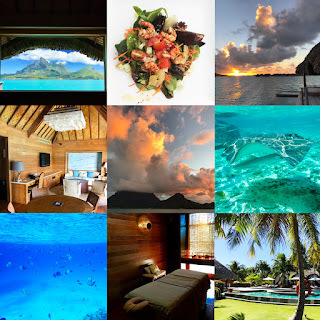 I finally had a chance to go recently and stayed at Four Seasons Bora Bora. While the stay was not 100% satisfactory, but it certainly came close. The only way to fly direct from United States to Tahiti is through Tahiti Nui or Air France. Both airlines offer nonstop flight from Los Angeles to Tahiti. Neither offer first class and only Air France offers lie-flat seats. Once you get to Tahiti, you will need to hop onto another plane to get to Bora Bora which is about 40 minutes away from Tahiti. Unfortunately there is no air condition at Tahiti airport so if you are arriving outside of the winter months (July, August), be prepared to be a bit sticky in the waiting area from humidity. There are two other more expensive/ comfortable options to go from Los Angeles to Bora Bora: private jet which will run 100k+ or Four Seasons private jet that you have to share with few other couples for 50k+. Once we arrived at Bora Bora airport, Four Seasons reps were there to receive us. We hopped onto a Four Seasons boat and arrived comfortably at the Four Seasons resort in no time. The lobby was airy and beautiful but not as grand as the one at Four Seasons Hualalai. After typical passport/ credit card formality, we were off to our room (#330). We had reserved an one bedroom Otemanu overwater bungalow suite. I have to say the bungalow was gorgeous! The bed has a dead on Mount Otemanu view. I repeat, the bed has a dead on Mount Otemanu view! As some of you may know, Otemanu is the tallest mountain and the center of the Bora Bora atoll. It is the view one sees in pretty much all Bora Bora adverts. To see it in person was much more awe inspiring. Photos just don't do it justice IMO. And of course to see it from my bed for the coming few days was icing on the cake. I liked the layout of the Otemanu overwater bungalow. As you know, sometimes resort rooms can have a "what was the architect thinking" layout. Well, this room was layout logically. There is actually two bathrooms in this particular suite. This is very helpful when you come with kids or when you don't want to share toilets. The living room sofa can be doubled as a bed. If you turn right from the foyer, you will enter the bedroom area with a large closet space. After that is the master bathroom with a beautiful freestanding tub and again, gorgeous view of Otemanu. Unfortunately the tub does not face Otemanu. However, there is an opening to the exterior deck from the bathroom so you can easily hop into shower when you get out of the lagoon. The exterior deck is also one of the highlight for this particular suite. You get a bale where you can lounge and read a book. You get a dock hammock which I'm deathly afraid of. I know one can almost jump on it and it'll be fine but since I'm an ok swimmer, the last thing I want is plunge into water if somehow the dock hammock becomes loose. There is also a plunge pool which honestly is kinda useless since you literally have a beautiful lagoon to swim in one foot away. You also get an outdoor dining area which we used extensively and a chaise lounge area to take in the sun. If you look at the resort map, there are essentially four over the water bungalow "arms". They are in 100, 200, 300, and 400 series. We stayed at the 300 series. IMO, the 200 series may be the best one as it is close to the Otemanu as well as restaurants. 100 series is also good as there are no more bungalows on the north side so when you sit in your tub, you will not be facing any bungalow. 300 series Otemanu overwater bungalow is also not bad as it has the closest view to Otemanu but you do have to trek a bit further to get to restaurants/ pools. Unfortunately there weren't that many buggies around and wait for them usually take about 15 minutes. One thing I want to applaud Four Seasons is that they put washing machines in each of the "arms" so you can wash your swim suite daily if you do so desire or your toddler's clothes. Do note that there are lots of traffic on the lagoon. So don't expect that if you rent the most expensive overwater bungalow (which is Otemanu overwater bungalow suite), you will have the outmost privacy. While the traffic doesn't compare to what one sees on the Grand Canal in Venice, you will see few boats zip by every 30 minutes or so. The people in the boat will be able to see you on the deck but not into your villa. Food at Four Seasons Bora Bora is good not great. Everything is competently done but I would not expect Michelin star quality food like the restaurants at Cheval Blanc Randheli in the Maldives. The best food I had was at St James at the city of Vaitape. If you happen to take one of the free shuttle from Four Seasons to Vaitape, you should go to this restaurant. Your stomach will thank you. Four Seasons Bora Bora has a closed off private lagoon where you can find lots of fish. This is very similar to the one in Four Seasons Hualalai although I would say the one on the Big Island is a bit better with more fish. Unfortunately if you are expecting lots of snorkeling right off the bungalow, you will be disappointed. There are few fish here and there but you will not see massive amount of fish right off the bungalow. With that said, there are excursions that you can book through Four Seasons where they will take you to places with lots and lots of fish. More than one would see at Hanauma Bay in Oahu for comparison. There are excursion where you can swim with black tip sharks which for me was interesting. They don't eat human so there is no need to worry. Four Seasons will also take you to a place where you can pet sting rays in the wild which is amazing. I highly recommend this. We also saw dauphins in the lagoon although they were quite shy so we didn't see any up close. My spa experience was good. I got a massage and my masseur was competent but not exceptional like the one I had at Cheval Blanc Randheli. The spa facility itself was nice but doesn't compare to Mandarin Oriental Las Vegas or Cheval Blanc Randheli. I would say the facility is on more rustic side than luxurious. The biggest city on the Bora Bora atoll is Vaitape. This city is basically on the opposite side of Mount Otemanu from Four Seasons. It takes about 30 minutes boat ride to get there. I highly recommend going there to get more of a feel of Polynesian culture. There is a store there called Home which sells jewelry, accessories, sculptures, pillows, linens, etc. This is the best store on the atoll. Everything is well presented and nicely done. If you are looking for something you actually want to put inside your home, this is the place. If you are looking for cheap chachkies, this is not the place for that. Four Seasons will give you an option to go to their July 14th Bastille Day celebration if you happen to be at the resort during French Independence day. Depending on your age and mood, you may want to join or avoid at all cost. This celebratory lunch is basically you have whole bunch picnic tables set up in a shallow water where a DJ plays current dance songs and you get to eat a decent buffet with all you can drink alcohol. This particular lunch isn't done by Four Seasons but rather by local party planner where apparently local resorts such as St Regis, Four Seasons etc. send their guests to. I couldn't wait to get out of there as I prefer sound of water and nature to DJ blasting latest dance tunes. But I can see if you are in mid 20s, you will probably enjoy dancing in water along with other guests. If you happen to come to Bora Bora in July, look for Heiva. Heiva is a dance competition celebration. Oddly, when I was at Four Seasons, the concierge was confused about the calendar of Heiva and had advised us incorrectly about it. I also noticed that Four Seasons did not sponsor Heiva at Bora Bora whereas places like St Regis and InterContinental did. Luckily I asked the locals and found out the correct date for the best male, best female, and best couple dancer competition. Unfortunately I was not able to make it to the best group dance. If you happen to come to Bora Bora in July, this will be the best cultural experience as none of the dancers are professional like the ones at Tahiti. This Heiva dates back for over hundred years before any of the resorts were build. The Heiva was done for the locals not for tourists.You can't get more authentic experience than this. In fact, when I was there, I would say spectator compose of 20% tourists and 80% locals. I had a wonderful time at Four Season Bora Bora. I absolutely would not hesitate to recommend this place. While it doesn't have the most amazing service like Four Seasons Koh Samui, or the most luxurious finish like Cheval Blanc Randheli, overall the experience at this resort is very good and I will definitely return here sometimes in the future.